December 31: It’s New Year’s Eve, and you’re looking as much like a disco ball as possible! You’re kicking off the New Year with a flash of sparkle and some sequins. You could walk onto the floor of Saturday Night Fever and win just for showing up. You’re popping bubbly and toasting to the end of one incredible year while cheering on the next. You begin affirming resolutions, determined to turn a new page in your life. Whether you’re tackling the Rocky Mountains from the powder in Banff or riding the gondola to the top of Breckenridge ski resort, the thrill of jumping on the snow-capped ridges pales instantly when considering looking out for the little ones. Making sure you don’t collide with inexperienced kids on the slopes is hard enough, but what about bringing them yourself? We came up with a few pointers to ease your mind and make sure everyone—your kids and the other skiers on the mountain—have a fun time. 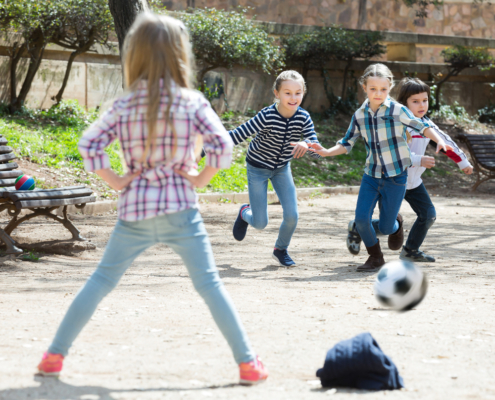 Across the world, the consensus is that youth sports and exercise needs to be a bigger part of our children’s lives—Particularly in the lives of those children who spend too much time in front of computers, video games and television.